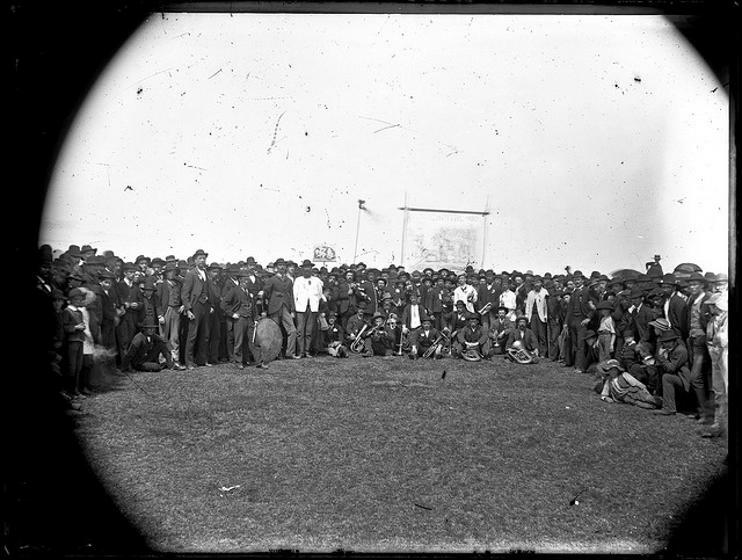 Miners strike gathering, Cooks Hill, 15 September 1888. Ralph Snowball collection. "Then came a calico banner, carried by members of the Burwood Lodge. On one side was a caricature of a body of soldiers leading the Soudan goat, with the inscription, A Little Capital Army ; on the other, working men shaking hands, with the inscription, Peace and Prosperity is our motto." Before unions began, workers had little leverage to negotiate with companies in matters such as pay and safety. The first union (or lodge) in the Hunter Valley was started in March 1856 at the Newcastle Coal and Copper Company . People were called to lodges by the Bellman. Unions were soon established at the AA Company, Minmi and Tomago sites. There was little cooperation between unions until the Coal Miners' Association of Newcastle was formed in 1860. James Fletcher, who founded one of the earliest unions, Borehole Lodge, became the first President of this Association. This organization charged a joining fee, which was saved for redistribution in times of strike. One of the first major issues addressed by the organization was ventilation. They pressed for government regulated working conditions. Wages were another point of contention, and low coal prices along with an oversupply of labour weakened unions in the late 1860's. The establishment of the Vend system renewed the involvement of unions. The first major strike in 1888 was due to a power struggle between the collieries and the unions, contributed to by the Vend system. Co-operation between the collieries made the unions unable to bargain for wages or better working conditions. workers Union. The new union was quick to show its strength in the Peter Bowling Strike, lasting from late 1909 through March 1910. It ended with the union leaders arrested and in goal. In the 8 July 1915, the Australasian Coal and Shale Employees Federation (informally known as the Miner's Federation) was formed from unions in New South Wales, Queensland, Victoria and Tasmania. The Miner's Federation's largest battle was that with coal baron John Brown, who in 1929 wanted to cut workers wages by over twelve percent. The lockout lasted 15 months, and led to the Rothbury Riot. The mid-1930's saw the rise of communism in connection with the unions, with the leadership of Charles Nelson and William Orr. They helped improved both working conditions and wages. In 1941, a miners pension fund was established. In 1946, the Federation managed to persuade the New South Wales government to form the Joint Coal Board, to help monitor and control the industry. Through this system public holidays, sick leave, increased wages and annual leave and safer working conditions were introduced. It also started a program to prevent black lung disease and set a world precedent in the eradication of this disease. The co-operation between the government and the unions did not last long. When the government failed to support a call for further increased wages and a 35 hour work week in 1949, the Miners Federation held a nation-wide strike. At this time the government tried to stop the strike by freezing union funds, however before it was implemented many unions had already withdrew their money from the banks and hidden it (see Brian Heawood's account).